First official release of Get Localization is out and now it would be a good time to go through all the new features we’ve cooked up for you. First to make clear, we haven’t changed our core functionality. We are still free for crowdsourcing but we’ve now added additional options to crowdsource in more professional manner. This means that the basic offering what we’ve will remain free like it has been past year. But we understand that basic crowdsourcing might not be solution to everyone. It’s a great option for developers to leverage their existing user base by means of engagement. For example when somebody translates your app, she or he becomes an ambassador for your app in their own country and that is exactly what you want. However, communities might not be easy to control. Bigger companies typically have deadlines and project plans. It’s hard to estimate when crowd will finish your translation completely. Our solution to this is bounties. You can set bounty for the language and we will make sure it will get translated by promised deadline. We give you recommended bounty amount that is based on your project size but you can set it yourself as well. Translators can choose their work so more than you set, more faster you will get them. All translations are provided by professional translators and they’ve 100% money back guarantee so you can be sure that quality meets your needs. You can also combine bounties with basic crowdsourcing by e.g. translating larger updates with volunteers and use bounties to validate and finish the translations. Bounties are now released and ready to be used. Second important feature is private projects. We understand that there might be some needs to make translation privately. You can freely grant access for your volunteer or professional translators to your project with our easy-to-use user manager. Third feature is called Pro Moderation. User quality control in Get Localization works through voting and commenting. This way you can rely on your whole user base in quality issues. In addition to that, you can optionally have our trained staff moderate your public project and select the best crowdsourced translations for your product. Basic fee includes moderation for English, French, Italian, German, Spanish, Swedish and Finnish. Moderator is suitable for larger companies to support for example their own community manager. 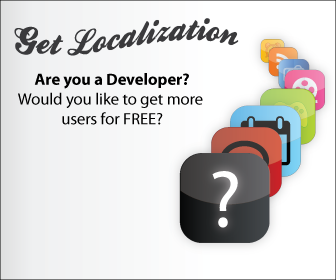 These features are part of Get Localization Plus Package (29,90€/month). Pro Moderation has an additional fee of 179€/month. All prices are VAT excluded. You can upgrade your existing project to Plus plan from the project settings. New users have an option to select wanted features when they register their project. As always, we are happy to hear your feedback. Let us know what you think!